Washing your windows consumes a great deal time and efforts? You can make a change now – simply call our representatives and order our window cleaning in Hither Green. We will manage this matter for you and the final result will be appropriate for all parts of your windows – glass surfaces, frames and sills. With our assistance, you will have the freedom to do whatever you desire with the time you usually spend for window cleaning. But our services will give you even more, as you can notice from our list of advantages. We also provide our professional services in nearby areas: Lewisham, Catford, Forest Hill, Mottingham, Blackheath. You can count on the cleaners for both household and business window cleaning. Every kind of glass surfaces are included in our professional routine. For instance, you can request a service for cleaning small or double windows, French doors, sash windows, patio doors and bay windows. In addition to these, we wash and polish garden window surfaces, greenhouses and roof glass. At home or at your workplace, you can always get crystal clear glass surfaces – just phone us! We have the skills and the right methods for the task. We provide residential and business window cleaning by using sophisticated techniques. You can rely on our professionalism for all types of glass surfaces, skylights and greenhouses. For windows placed up to your fourth floor, we use water-fed extension poles. This technique is comfortable and allows safe cleaning systems – the poles are attached to the water tank in the van. For high-rise window surfaces, our rope access team will grant you quick and great end results. You can gain a lot from these methods right now – just dial 020 3746 3113 and book a visit! With our abilities and craftsmanship, the marvellous look of your property will be noticeable swiftly – the experts of commercial window cleaning will achieve this. We utilise water-fed extension pole system for fast and well organised window cleaning, up to the fourth floor. For office buildings taller than that, we use the latest rope access methods. With these appliances, we are prepared reach the highest glass panes, even on the skyscraper-sized buildings London is so famous about. From small shops to towering business scrapers, we ensure top-notch services – take advantage, now! 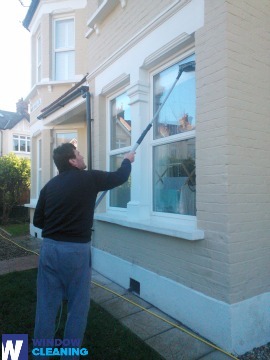 Profit from our home window cleaning in Hither Green – we provide five-star services for your home on attractive prices. We use purified water to clean the windows thoroughly. We stay safely on the ground and clean with water-fed pole system. Find us now - ring 020 3746 3113 or just use our booking form. Our representatives will help you book and answer any questions. You will love the results of our domestic services, we assure you to that!